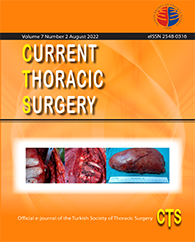 2Kartal Kosuyolu Heart & Research Hospital, Thoracic Surgery, Istanbul, Turkey DOI : 10.26663/cts.2018.0003 Viewed : 566 - Downloaded : 293 Congenital lobar emphysema (CLE) is a rare developmental anomaly of the lower respiratory tract, which generally presents during the neonatal/pediatric period. Lobectomy is the only curative treatment for CLE. An 18-year-old male with enlarging left anterior chest wall deformity and progressive breathlessness for the last 2 years admitted to our clinic.